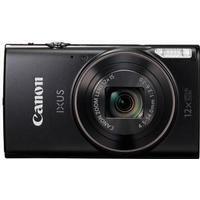 The Canon IXUS 285 HS is a diminutive, ultra -portable camera that means never having to miss out on a great picture moment. Once it’s slipped into your pocket you’ll barely notice it’s there, making this the perfect travel companion. The IXUS 285 HS, slim enough to pop in a bag or pocket comfortably, hits all the right notes to make this an excellent purchase for the travellers or opportunist photographers amongst you. There’s a 20.2 million pixel CMOS sensor, a 12x optical zoom, and a digital zoom that extends to a whopping 48x if you fancy yourself as a freelance paparazzo. It’s cheap too, and comes with a few handy features such as optical image stabilisation (a still camera version of cinema’s Steadicam), some interesting editing functions, and inbuilt Wi-Fi to allow you to remotely operate the camera – particularly useful if you’re a fan of nature photography – or instantly update your social media if that floats your boat. The picture quality is very decent indeed, although it has to be pointed out there are limited functions for the control freaks out there. If you like total control over your settings you may be disappointed. The camera’s metering system measures the environment precisely to ensure some nice exposures, but if you want to adjust white balance, brightness and so on, there’s a Program mode for you to play around with, but that’s broadly it. There are some filters included (such as monochrome or retro) with a feature called Creative Shot. The Canon IXUS 275 HS records full HD videos, but doesn’t stretch to shooting in 4K. Video images are sharp and capture motion with great fluidity and clarity nonetheless. Finally, this camera is great in low light conditions, so if you want to take some stunning dawn or sunset pictures, you won’t be disappointed. Why you should buy it: Inexpensive and ultra-portable, the Canon IXUS 285 HS takes great photos and although not significantly better than the latest smartphone cameras, still beats them for its zoom and battery life. A perfect camera for the travellers or budding journalists amongst you.